ZJ mdl. TPX6113 5-Axis Horizontal Boring Mill w/ Newall C80 Programmable DRO, 4-800 RPM, 50-Taper Spindle, 5.12” Spindle Dia., 30” Boring Head, 56” x 63” Table Indexable @ 1 Degree.Sinada mdl. SB-100 5-Axis Horizontal Boring Mill s/n 198 w/ SWI Trak 103 3-Axis DRO, 9.5-1000 RPM, 20” Boring Head, 2.75” Spindle, 43 ½” x 51 ½” Table. Bullard 4-Axis Horizontal Boring Mill s/n 29114 w/ 7-850 RPM, 50-Taper Spindle, 26” Boring Head, 36” Quill Travel, 49” x 80” Table. Cincinnati No.5 Vertical Mill s/n 4J5V1Z-25 w/ Newall DRO, 14-1400 RPM, 50-Taper Spindle, Power Feeds, 20” x 94” Table. Bridgeport Vertical Mill s/n 63476 w/ 1Hp Motor 80-2720 RPM, Power Feed, 9” x 36” Table. Knuth mdl. DL620/5000 Heavy 49” x 197” Geared Head Gap Bed Lathe w/ Knuth Programmable DRO, 4-315 RPM, Inch/mm Threading, Tailstock, Steady Rest, 40” 4-Jaw Chuck. Knuth Sinus 330/3000 26” x 118” Geared Head Gap Bed Lathe s/n 05021025 w/ Knuth Programmable DRO, 9-1600 RPM, Inch/mm Threading, Tailstock, Steady Rest, 20” 4-Jaw Chuck. 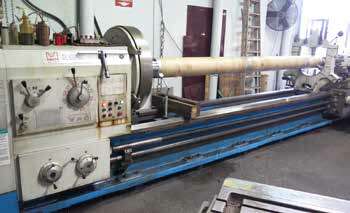 LeBlond 30” x 144” Lathe w/ Inch Threading, Tailstock, Steady Rest, 24” 4-Jaw Chuck. Victor mdl. 2060S 20” x 60” Geared Head Gap Bed Lathe w/Newall C80 Programmable DRO, 20-1550 RPM, Inch/mm Threading, Tailstock, Steady Rest, 20” 4-Jaw Chuck, 12 ½” 4-Jaw Chuck, 10” 3-Jaw Chuck. Cadillac mdl. 2260 22” x 68” Geared Head Lathe s/n 060110 w/25-1500 RPM, Inch Threading, Tailstock, Steady Rest, KDK Tool Post, 12”” 3-Jaw Chuc. Hyster mdl. H300A 27,700Lb Cap Diesel Forklift s/n A19P-2309X w/ 2-Stage Tall Mast @ 144” Lift Height, Adjustable Forks, Pneumatic Tires. Hyster mdl. SC180 18,000 Lb Cap LPG Forklift s/n SC101973 w/ 2-Stage Tall Mast, Solid Tires. Hyster 18,000 Lb Cap LPG Forklift w/ 2-Stage Tall Mast, Pneumatic Tires. Hyster 18,000 Lb Cap Diesel Forklift w/ 2-Stage Tall Mast, Pneumatic Tires. Hyster mdl. H165E 16,150 Lb Cap Diesel Forklift s/n B7P-5667R w/ 2-Stage Tall Mast @ 212” Lift Height, Pneumatic Tires. Hyster Challenger 150 12,000 Lb Cap LPG Forklift w/ 2-Stage Tall Mast, Pneumatic Tires. Hyster S80P 8000 Lb Cap LPG Forklift s/n B4D4796Tw/ 2-Stage Tall Mast, Solid Tires. Hyster 8000 Lb Cap Forklift w/ 2-Stage Mast, Solid Tires. Clark mdl. C500-S80 7425 Lb Cap LPG Forklift s/n 685-0022-5421FA w/ 2-Stage Mast @ 147” Lift Height, Side Shift, Cushion Tires. Toyota mdl. 52-6FGCU35-BCS 6850 Lb Cap LPG Forklift s/n 61991 w/ 3-Stage Mast @ 198” Lift Height, Side Shift, Cushion Tires. Toyota mdl. 52-6FGCU35-BCS 6850 Lb Cap LPG Forklift s/n 61798 w/ 3-Stage Mast @ 198” Lift Height, Side Shift, Cushion Tires. Toyota mdl. 7FGCU35-BCS 6850 Lb Cap LPG Forklift s/n 60359 w/ 3-Stage Mast @ 199” Lift Height, Side Shift, Cushion Tires. Towmotor mdl. 540LP 6000 Lb Cap LPG Forklift s/n 540590141 w/ 2-Stage Mast, Solid Tires. Hyster 4700 Lb Cap LPG Forklift w/ 3-Stage Mast @ 167” Lift. 2004 Ford F-250XL Super Duty Utility Truck Lisc# 87237S1 w/ V8 Gas Engine, utomatic Trans, Utility Bed, 43,743 Miles, VIN# 1FDNF20L44ED75968. 2001 Ford F-350XL Super Duty Crew Cab Utility Truck Lisc# 68637P1 w/ Triton 1- Gas Engine, Automatic Trans, Utility Bed, 53,804 Miles, VIN# 1FTWW32S01ED50970. 1997 Ford F-150 Pickup Truck Lisc# 6R04489 w/ Triton V8 Gas Engine, Automatic Trans, 146,683 Miles, VIN# 1FTZF4767WKA70968. 1997 Ford Ranger XLT Pickup Truck Lisc# 8A20273 w/ 4.0L EFI Gas Engine, Automatic Trans, 242,278 Miles, VIN#1FTCR24X7VPB25723. 1994 Ford F-350XL 12’ Stake Bed Truck Lisc# 7E02821 w/ V8 Gas Engine, Automatic Trans, VIN# 2FDKF37GZRCA37306. Ford Econoline-350 Box Truck Lisc# 3H38587 w/ V8 Gas Engine, Automatic Trans, 184,346 Miles, VIN# 1FDJE37LOEHA86809. Ford 2000 Industrial Tractor s/n I548 w/ 4-Cylinder Engine, 66” Forward Bucket Scoop, 65” Grader Attachment, 3-Point Hitch. Step Deck Semi Trailer Lisc# UT2428 w/ Rear Ramps. JLG mdl. 40F 40’ Extendable Boom Platform Lift s/n 731786 w/ Gas/Propane Engine.